8P/Tuttle Sketch on Dec 10/11th 2007 using a 8.5" F/7 reflector with 32mm 1.25" eyepiece. Tuttle was very high in the circumpolar sky within Cepheus approximately 1.5 degrees from Gamma Cephei - the naked eye star which marks the 'roof' of this house-shaped constellation. 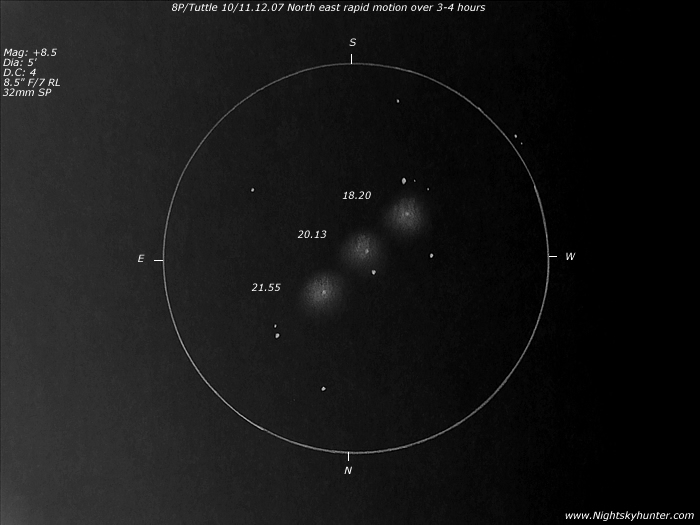 This sketch shows the position of Tuttle with respect to a triangle of bright field stars at 18.20, 20.13 and 21.55 UT. The comets rapid NE motion is very obvious. This is slow compared to how fast it will be moving when closest to the Earth during late December when it will be a faint naked eye object. The comet is a short period object with prograde motion meaning it moves around the Sun in its orbit in the same direction as the planets and main belt asteroids. The icy nucleus of this comet is several kilometers in diameter. If it hit the Earth it would most likely cause a near extinction event!.